MWg's Atom Life (£200 inc. VAT) is a mid-range Pocket PC, offering excellent connectivity and plenty of features. 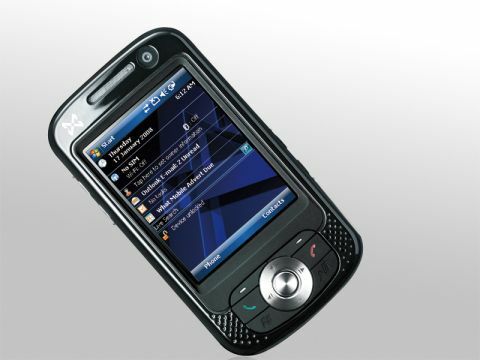 But with no hardware keypad, the Atom takes the approach of a traditional PDA. The front of the device is filled mostly by the 2.7-inch touchscreen display, along with a set of navigational buttons below it. Text is entered either using handwriting recognition or an onscreen keypad. We found both input methods good enough to create documents or emails, but fiddly when we simply wanted to send a quick text message. It's easier to make phone calls, where a large onscreen numeric keypad allows you to dial numbers without having to use the stylus. With a large speaker at the top, we found call quality to be loud and clear. The Atom Life features a pleasing design - it's not the smallest of handhelds, and weighs in at 145g, but the curvy styling and silver highlights help to make it appear smaller than it is. You'll find plenty of features crammed beneath the plastic casing, with connectivity to the fore. Fast download speeds are provided by 3G/HSDPA, and you'll also be able to take advantage of wireless networks using the integrated Wi-Fi adapter. Wireless file transfers are made possible by the inclusion of Bluetooth and infrared. Files can be backed up to mini-SD cards, and the card reader is easily accessible, so you'll be able to swap cards without having to turn the device off. There's little here to differentiate the Atom Life from other Windows Mobile 6.1 devices, which will suit most business users just fine. Word, Excel and Powerpoint Mobile are all provided as standard, along with Outlook Mobile, making it easy to sync your contacts, calendar and emails when you return to the office. You'll also find a PDF viewer in place. The Atom offers a VGA camera on the front for video calls, and there's a 2-megapixel camera on the rear. It takes vibrant photos, although images can suffer from slight distortion, with details losing crispness when viewed at full size. With the camera situated on the corner of the device, it's also too easy to obscure the lens with your finger when taking photographs. A host of onscreen icons appear after you've taken the shot, making it easy to save, delete or even transfer it wirelessly to other phones or laptops. With no major problems apparent, the Atom is a useful business tool, packing in plenty of features. The lack of hardware keypad means it won't suit everybody, but it is worth a look if you're seeking a traditional PDA.